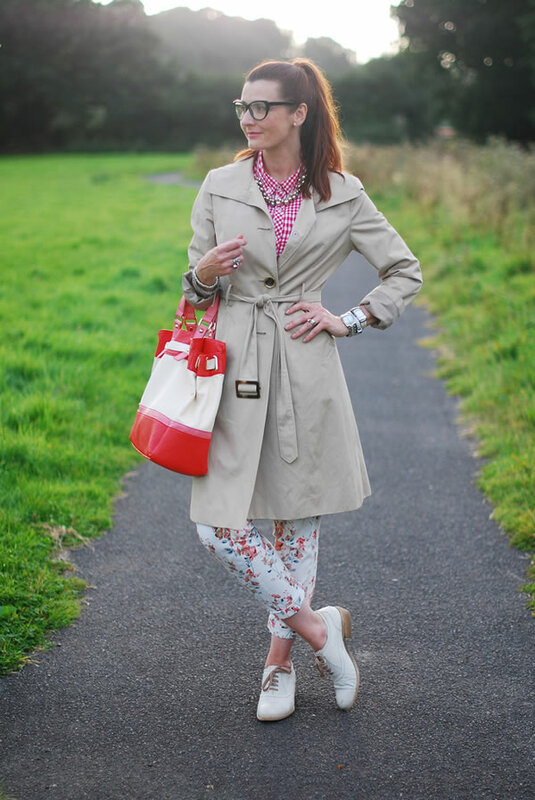 Catherine is one of the most colourful, stylish bloggers I know. There is hardly a day when she does not wear colour, so who better to give us all a style lesson on how to wear colour than the amazing Catherine? I was delighted that she agreed to this interview. You will learn so much from her answers! Hi Catherine. Thanks for taking the time out to answer a few questions for 40PlusStyle.com. Can you tell us a little bit more about yourself? Of course: I’m a 40 year old marketing manager from England – I live in the South West now but still call myself a Londoner; although I love living in the country, I’m a city girl at heart. I’m happily married to Mr. Summers who is also my very patient (but very talented) photographer – I find not being behind the camera very frustrating because I have a degree in photography! I have so many loves in life, but to name a few: astronomy, crafts, DIY (the crafty type AND plastering walls type), theatre, travel, fitness – I like a lot of things. I just turned 40 this summer! I really started it to combine my two loves – photography and fashion. I wanted to see if I could improve my style as I was approaching 40 (I describe myself as a non-20 something personal style blogger) by documenting what I wore on a regular basis, and I’ve always been a wannabe graphic designer/makeup artist/stylist/interior decorator! So the combination of fashion, photography and blog design creates the perfect hobby for me. You call your blog Not Dressed as Lamb. Why did you choose to call it that? I wanted to make it clear what my blog was about with a good name – I came up with a LOT of duff names when trying to choose! I was thinking about the expression “mutton dressed as lamb” and how I wanted to avoid dressing that way as I got older. I simply thought Not Dressed As Lamb was a more attractive way of saying it, and hopefully explaining that it’s a style blog by a slightly more mature woman. I knew it was the right name; it really stood out in the shortlist. I can’t imagine it being called anything else now! What to you, is age appropriate dressing? I think if you follow these guidelines you can’t go wrong – I actually think older women can often get away with more outrageous clothing than a 20 something because as you get older it’s less about fashion and more about style and knowing what suits you. I’d describe my style as eclectic, but veering towards preppy with a twist. I also can’t get enough of pattern mixing and bright colour. I feel that you have a very unique and wonderful style that involves a lot of colour. What tips do you have for 40+Style readers that find it difficult to add more colour to their wardrobes? Over the last 15 years or so I have wheedled out most of the black that I had in my wardrobe, so much so that I now find black incredibly hard to style and am quite afraid of wearing it (except for in the evening, strangely). I can guarantee that you will receive the most compliments when wearing bright colour – it always cheers people up and the most common thing I hear is “wow you look lovely and bright”. You shouldn’t be afraid of wearing more than one bright colour at one time (I’ll wear up to three or four! ), but if you’re a colour virgin I’d say start with a vivid accessory – a bag, pair of shoes or scarf in the brightest red, turquoise, yellow, etc. you can find. Consider wearing other neutrals in place of black, like white or marl grey, or a lovely rich camel colour. Once these are paired with your bright accessory, you’ll look (and feel) lighter and brighter. When you’re used to having bright accessories, move onto a pair of coloured jeans or something bold for your bottom half; if you start only with bright tops there’s the danger of never moving on from constantly wearing black trousers and skirts. Finally, for every bright piece of clothing you buy, donate or recycle one black item… and be ready for those compliments! 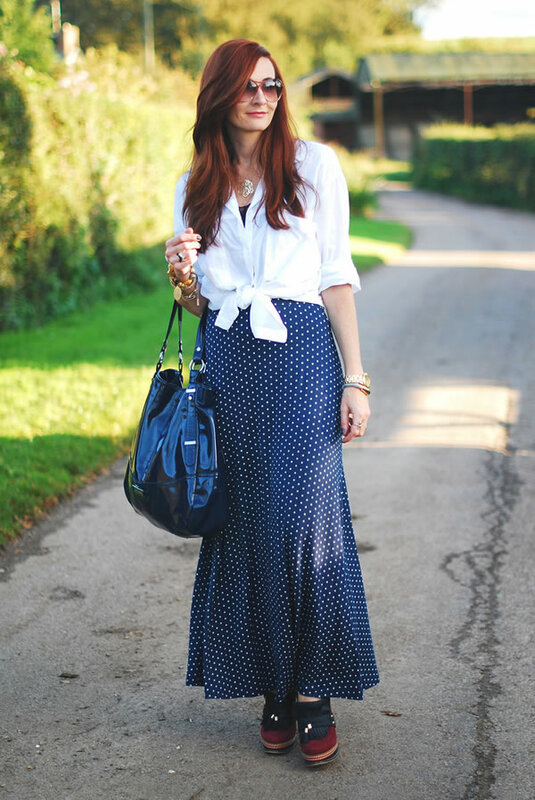 My number one inspiration is other bloggers’ style. I used to physically cut out images from magazines and keep a scrapbook for inspiration, but now of course there’s Pinterest to do that virtually for me. Living in the UK means the weather greatly influences what I wear, but I’ll usually just either decide on a particular “look” for that day – ladylike, preppy, or masculine chic for example – or I’ll choose one item I fancy wearing and base the rest around that. Most of my looks can be traced back to an outfit I’ve seen on a blog as inspiration, from a whole outfit to just the way a shirt’s been tucked in. I’ve never had a colour consultation in my life (probably shows by the way I randomly throw colours together! ), but one colour I never wear next to my face is red. I’m willing to be proved wrong, but I just don’t like it next to my skin tone. I’ve also learnt that there are certain styles that suit my body shape more than others, and I’m all for showing off the bits I do like and disguising the bits I don’t. I’ve never liked skirts or dresses above the knee on me, but I like my arms and shoulders, so sleeveless t-shirts with a maxi skirt for example is a great silhouette for my body shape. I’m only just 40, but I think my style has become much less safe in the last few years, and even more so since discovering fashion blogs. Ten years ago I very much wore suits to work and jeans and t-shirts at the weekend; now I don’t dress much differently between weekdays and weekends (it helps having a super relaxed dress code at work). Strangely I would say I’m more interested in fashion than I was 20 years ago, despite at the time being an avid buyer of Vogue and Elle magazines. I think fashion and style – especially street style – are so much more accessible now with the internet. As it makes trends so accessible, there’s much more choice of clothes that both suit your body shape/style and are on-trend. It makes me feel better about myself… simple as that. If I catch a glimpse of myself in the mirror with hair all over the place, a tired face and old pyjamas, I won’t feel as positive and radiant (for want of a better word) as I do when I’ve made an effort when I’m going out. Plus I’ve always been an artist of sorts (meaning art was my best subject at school and I’ve always been described as “arty”), so dressing up and doing my hair and make up is second nature, like creating a little mini work of art each day. I love this vintage polkadot dress. It’s the perfect fit and shape, it’s sheer, it’s got polka dots, and no-one else will have one like it as it’s vintage. I get so many compliments every time I wear it. Due to the colours it’s actually quite hard to style, but it means I don’t wear it that often, so it’s extra special when I do. I’d not worn it with purple before, so a black dress with mustard polka dots and purple accessories was a winner for me! Funnily enough I think I’d be clueless about trends if it wasn’t for fashion blogs! However, I think I follow trends more than I realise; for example I was all over pastels in the spring/summer, and I’m warming to oxblood at the moment. I may be a bit late to the studding party, but I’ve bought a big pile of assorted studs from eBay and will soon get studding lots of items I’ve recently thrifted. Don’t be afraid to wear what you like and what will bring a smile to your face when you look in the mirror, it’s as simple as that! I’d rather see someone who isn’t necessarily regarded as classically “stylish”, but is having fun with what she wears, than someone who purposely dresses dowdily and apologetically because she thinks that’s what you’re meant to do as you get older. I think your age should be directly proportionate to how fun and bright you look – the older you are, the bolder the outfit! I only ever intended to do this for one year to see how it went and if I enjoyed it. It has been so much more than I could ever have imagined – what I didn’t expect was the amount of wonderful comments, support and good feeling that’s been passed my way! You know the often asked job interview question: Where do you see yourself in five years? In relation to blogging I’d have to say my dream is to write a book one day. I’ve seen other bloggers do this, and as I loved writing stories when I was a kid (yes, another wannabe profession to add to my list! ), it would be so amazing to see that happen. I even came up with a pen name when I was young, though now I think I’d stick with my real one. ‘Elizabeth Hartington’ just doesn’t seem very me, somehow…! Note from Sylvia: I’m sure you will agree with me that there were many valuable lessons in her answers here. If you don’t already follow Catherine, be sure so check out her amazing blog Not Dressed As Lamb and be inspired by her incredible style! I LOVE all of these outfits (though I don’t think I could pull off the first one 🙂 ). I’m going to print all of her photos and keep them with me when I go shopping as inspiration! Good luck Rita. I too hope that you will upload some of your outfits in the style forum! I haven’t been to the forum yet, so I’ll check it out. 🙂 I don’t like to have my photo taken (a life long aversion…I think I saw something about getting your soul stolen in an horror movie when I was a kid…LOL), but I could arrange things on hangers to give some ideas. Thanks!! It is a tip from Rachel Zoe, that famous stylist to the stars. I don’t like her but she was right in this one. Of course it does not apply to all your outfits. Fortunately not. But I have had some eye openers. Have a look at these photos I uploaded to the Forum. Clearly the trousers are too long, but I have worn them like this for several YEARS. Great interview with a very interesting and beautiful woman. I recognize a lot in her; I am creative, arty, eclectic and colorful as well and also have many interests and hobbies. I love her style; the polkadot dress with purple is gorgeous. And what fantastic pictures her husband takes. The polkadot dress is my favorite too. Truly one of a kind! I know Catherine’s blog through your blog Sylvia, and I love her. She is a master. I wish I could style like she can. I visit her blog more and more. She is also funny and she can laugh about herself. Not scared at all…. She once showed lots of photos from her earliest childhood till now. Very funny and brave. Reminded me of the time you showed us your childhood photos Sylvia. And I so agree with Catherine’s statement that dressing yourself is a little mini work of art. She is a person I would like to be friends with. She is definitely one of a kind and as you say, a great writer too. I love the color combinations in those outfits. Yes, they are creative and unique. I really enjoyed answering your questions, and you were very patient as I took quite a long time to get them back to you. I’m very humbled and very flattered that you asked me – thank you again! It’s you I have to thank Catherine for your very thoughtful replies that I’m sure will help more women add colour to their wardrobes. Picking my favorite outfits was no easy task as you have so many good ones on your blog! Absolutely love each outfit- and I would so wear them all. One thing I learned, I wear boat shoes as flats as I live in Florida, I really never thought of Oxfords, will be trying that look soon! Thanks for the inspiration! Great to hear that Catherine has given you some good ideas! I believe the colors in the photo 1 and 6 (when the jacket is removed) clash. i wouldn’t wear this combo but that’s my personal opinion and taste. But Catherine, being true to herself, loves this combo. That’s what fashion is all about – what is a reflection of you. It’s advanced pattern mixing for sure. And that’s not to everyone’s taste, but I think the combination of colours work really well in both cases. older women can often get away with more outrageous clothing than a 20 something because as you get older it’s less about fashion and more about style and knowing what suits you. Thank God I found this website! It makes me feel so GOOD about myself (41) and to see that it does exist fashion for women over 40 that looks good! Welcome Camilla! Glad to have you with us. Have fun exploring all the articles and the looks and conversations in the style forum. What elements define your desired style?